Home What are the most common delays in customs? What are the most common delays in customs? To avoid customs holdups it’s important to understand the causes of the majority of customers delays. 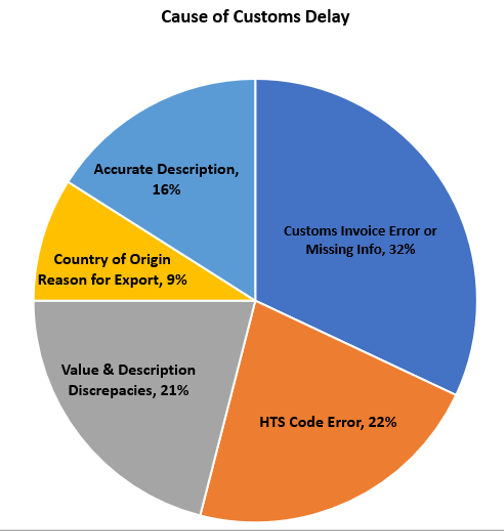 A 2017 study done by DHL Express showed that 32% of delays are caused by errors or missing information on the customs invoice. A customs invoice, whether it’s a commercial or proforma invoice is required for all commodity shipments. A good customs invoice should contain company letterhead. Some countries require the customs invoice be on the shipper letterhead, so it’s a good practice. You need a complete an accurate number for both shipper and receiver. This is required by several countries such as China and Brazil. The terms of the sale, also known as incoterms, are not listed. These must be included. Common terms are DAP, DDP or CIF. Not filing out the type of export or import. Examples include: Permanent, Temporary or Repair. These are used to provide a global standardized system for understanding what products are without language barriers. A complete and accurate HTS code for the commodities shipped. A proper and complete description of the commodities shipped is required. A customs invoice must have a value even if the goods shipped are not for sale or resale, such as with samples. The total Quantity and value for each item shipped is also required and must match the value on the air waybill. When providing the goods description remember that part numbers don’t mean anything to customs. A general description of the goods, product, commodity should be provided on the air waybill, BOL and a full description provided on each line item of the customs invoice. Often confusing is the term country of origin (COO) and country of manufacture. To understand the term you have to look at it from the customs officials perspective and ask yourself: in what country are the products, goods, commodities manufactured, either wholly or in-part according to the destination countries rules of origin, or in the case of a trade agreement the agreed upon rules of origin. So in the hands of a customs official the country of origin and country of manufacture are the same thing and have to do with where the product, goods or commodities were manufactured, not where they were shipped from. Remember, our team of shipping experts is always here to help with your questions and concerns. We’re happy to help with your documentation. What is the Harmonized Tariff Schedule (HTS)?